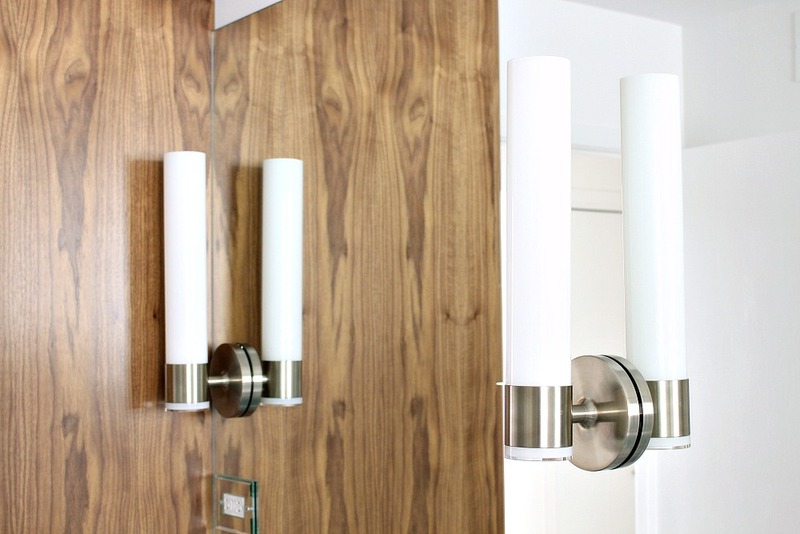 When I was plotting the lakehouse bathroom renovation, I fell in love with these Kohler Purist sconces and decided that I had to work them into the design but there wasn’t a lot of room, so we had to learn how to install bathroom sconces on a mirror! Spoiler alert: it looks sooo good! Because we wanted double sinks and a linen tower, there was not a lot of room for sconces and mirrors, so my original sconce, round mirror, sconce, round mirror, sconce idea was a no-go. I could keep the round mirrors and do a light above them, or keep the Kohler sconces and try something crazy: figuring out how to install bathroom sconces on a mirror. Turns out, I’m not the first one to try installing a bathroom sconce on a mirror and so, after rounding up some inspiration, I decided to go for it. The sheet mirror and sconces are finally installed, and I just love how they look! I forgot how much brighter and larger a small bathroom feels with a huge mirror – it just bounces so much light around – way more light that what we would have gotten from two round mirrors. I know that sheet mirrors get a bad reputation for being “builder’s basic,” but I just love them for a small space – and I think that figuring out how to install bathroom sconces on a mirror just gives the mirror a more custom look. 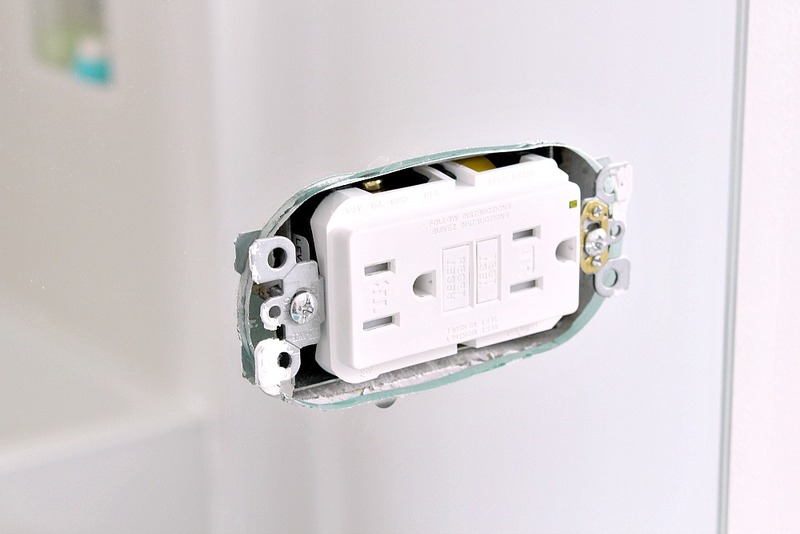 Once we were committed to this idea and had ordered the sconces, and the electrical boxes for the lights and new receptacle boxes for the outlets were measured/placed/installed by Handy Hubby, I spent some time researching local places that cut custom glass. I picked a great place that also does cool things like stained glass and textured glass – they seemed to be the most ambitious glass company in town. Although I went to the shop prepped with measurements, they sent someone to double check – for which I am incredibly grateful. Living in the country, we actually paid a lot (mileage/time) for this service, but it was worth it. In their words: it’s better if they screw up the measuring! I had recently been burned by the careless counter top place, so I was incredibly cautious about this purchase – but luckily, so was the guy who came out to measure. I think it took him about an hour to carefully measure the placement for the holes and outlets, which he triple checked. A standard sheet of mirror is 72″ but we needed 72 3/4 (so close!) so it was a special order – which increased the time and the cost even more. It was delivered and installed without any problems and was glued in place to avoid clips because I just don’t like the look of mirror clips. They did a great job cutting out the circles for the lights and the holes for the outlets – getting that measurement right is my best tip for how to install bathroom sconces on a mirror properly. When cleaning the glass for these photos, I did notice one fleck of imperfection under the glass but it’s minuscule. 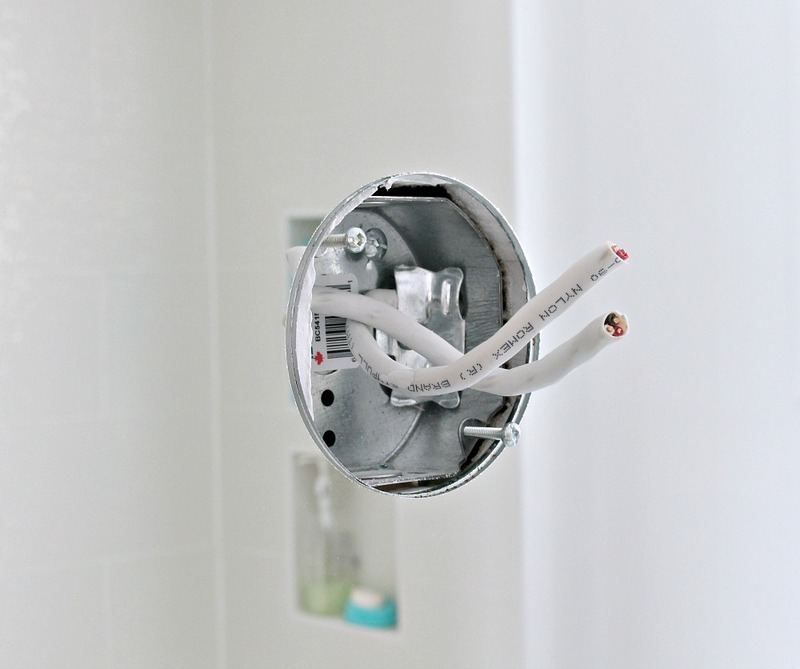 Once the mirror was affixed, our job was so easy: we installed the light fixtures per instructions (and just like you would on a wall) but with one caveat: we had to make sure not to crank the screws too tightly, otherwise pressure could crack the glass. It was a two-person job but fairly straight forward. These sconces are securely affixed, but I wouldn’t want to monkey around with them. I was really curious to see how much the back of the sconce is reflected in the glass, but it’s not much at all: just a shadow really – no wires or anything show. We decided to put the outlets in the mirror too. Stashing them inside a cabinet or to the right of the vanity didn’t feel practical for us (although it would have kept them out of sight). We thought about putting them in the backsplash, but cutting into the stone seemed like a shame. Someone suggested putting an outlet in the side of the linen tower, but cutting a hole in the walnut seemed like a shame too. Seriously, outlets are a real bummer! After spotting an outlet in a mirror on Pinterest, I decided that the mirror was the best spot for accessibility and hiding them somewhat. I regret how high we put them but we were still contemplating a higher stone backsplash or maybe adding a shelf at the time, so we intentionally left (too much) wiggle room. 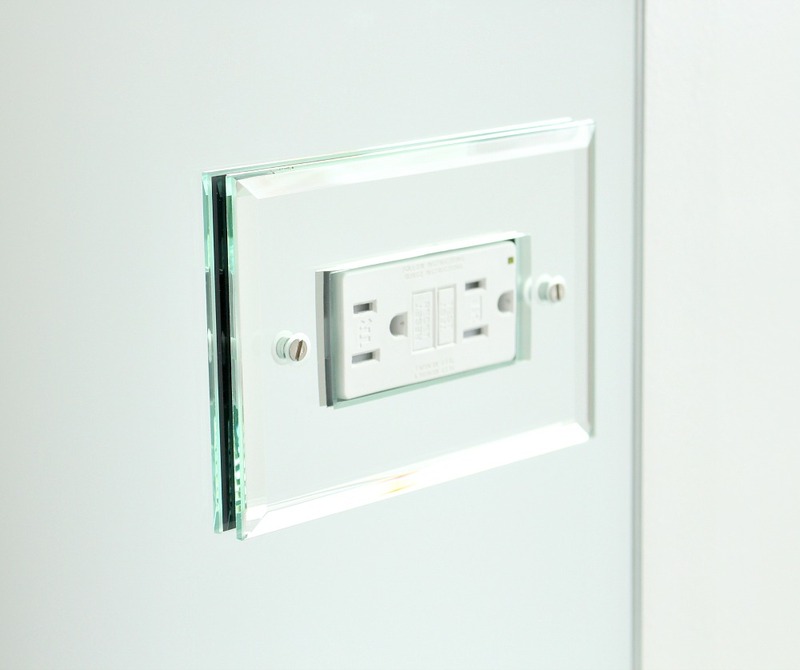 But from some angles there’s a green tint and if you look just the right way – and get in nice and close – you can see a shadow/reflection of the back of the mirrored outlet cover. I spent a long time looking for a mirrored outlet cover. So many of them are a fake finish and I wanted actual glass. 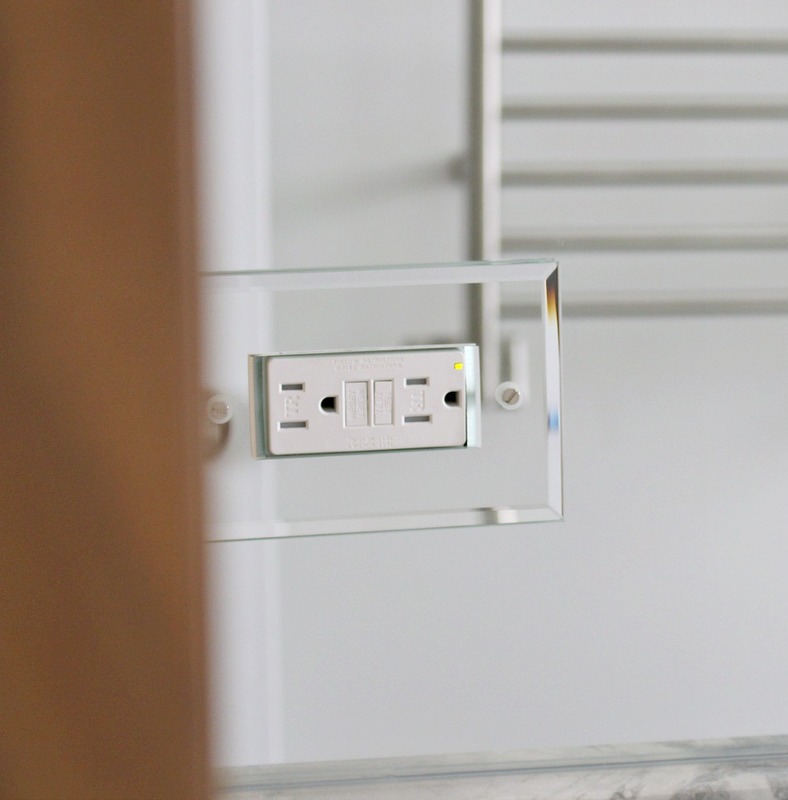 This one was the best I could find but I don’t love the bevel because I opted not to have the edge of the mirror itself beveled – it’s just a clean, ground edge, for a more modern look. Hopefully I can track down a simpler outlet cover in the future but, for now, this will do just fine. 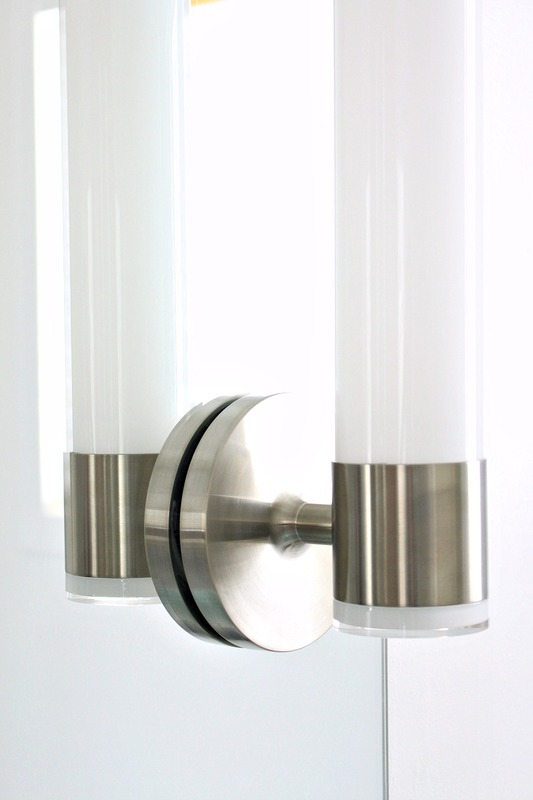 I’m just relieved that figuring out how to install bathroom sconces on a mirror was super easy! I just love how the bathroom is taking shape! We’re so close to being finished. HUGE thanks to Kohler for collaborating with me on this bathroom renovation. Wow! You really are doing a great job with your bathroom renovation! You pay such close attention to each and every detail. You have a very unique style that differs from a lot of blogs out there, which makes you unique, and that is a very good thing! Great job! Thanks, Nicki, that's so nice of you to say! I definitely feel like I've over-thought every decision in this bathroom and I'd still do some things differently, if I had the chance. 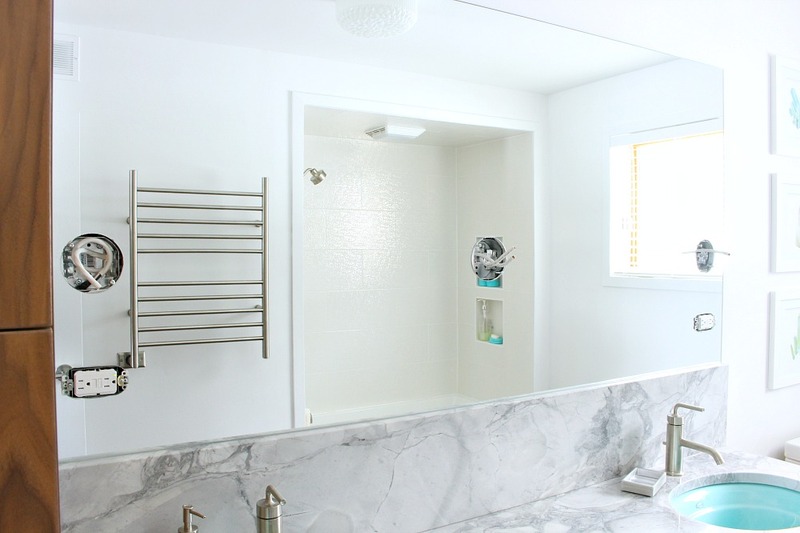 I learned so much from the bathroom reno in our townhouse but I was so relaxed about that – I think it took me a couple of days to plan and source everything. This took me months to plan! I shudder to think how long I'll agonize over kitchen reno details, lol. Funny you should mention making sure to tighten the screws ever so gently. Shortly before my husband and I were to get married he tightened a screw in the bathroom of my parents house and cracked the wall mirror. Just to let you know we're are happily together for 29 years. At the 7 year mark in our marriage I was anticipating something dreadful but nothing happened! Oh, and I do love your mirror and sconces. We have 2 bathrooms with huge wall mirrors and I love them for all the reasons you mentioned. Oh gosh, he must have felt terrible!! So happy to hear that you made it through those 7 years unscathed – and what an inspiration that you've been happily married for nearly 30 years! And that he still does DIY projects with you (I still love that he made the ornament stands!) I hope one day my Hubby and I can say that 🙂 Huge bathroom mirrors are really underrated but I feel like they're going to get popular again once people realize how much more light they throw around than the small mirrors that are everywhere right now. Just give it time, lol. I'll patiently wait for brushed nickel to circle back again too, haha – I'll be ready! Tanya, this is coming together so beautifully. I love the vertical TP holder, too. Mimics the sconces and utility-wise, so smart. You are so great the way you really, really pay attention to the details, it is so worth the effort in here. Bravo! Thanks Michelle! Gosh, I was so nervous about this plan and pictured a million ways it could go wrong, lol. 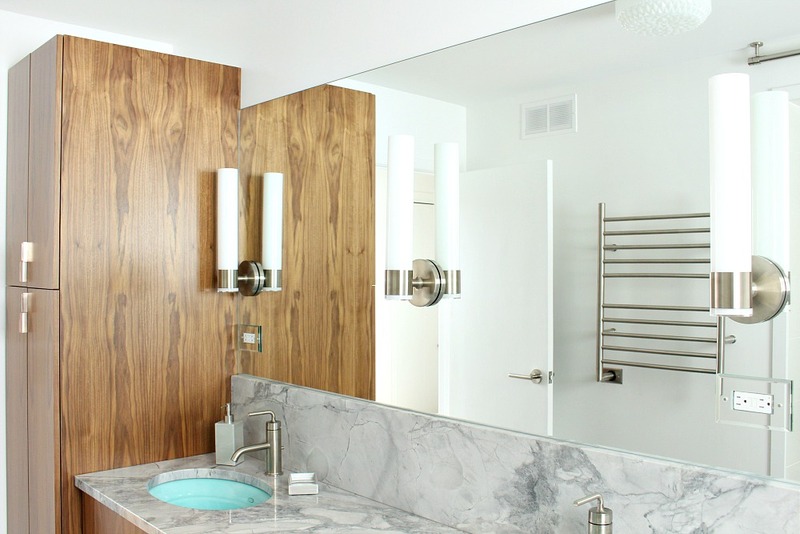 I definitely wanted those sconces and I'm so happy I went for it because they're so beautiful and I love that everything is from the same Kohler Purist line – I'm very pleased with the matchy-matchy feel. It feels so cohesive, which makes me smile every morning! 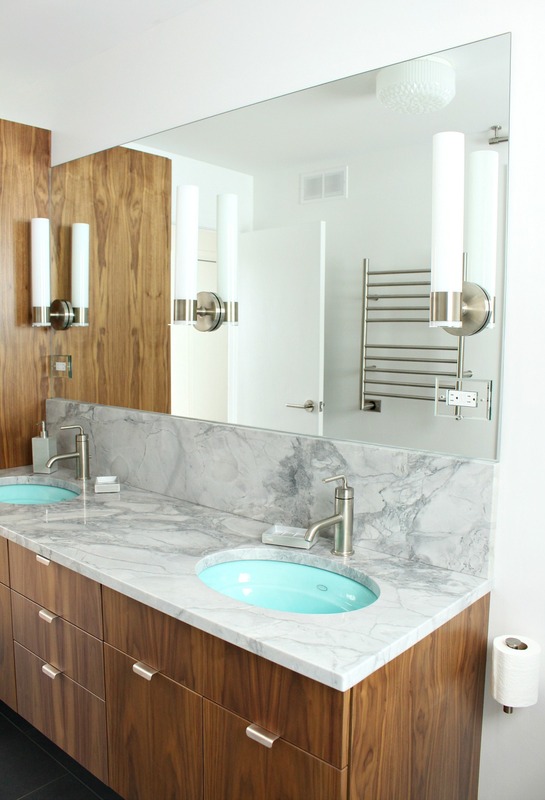 Hi Tanya – I think your bathroom is gorgeous! So fresh and clean with a beautiful touch of turquoise. I enjoy your blog. Haha, thanks Wilma! I'd be happy to, but only if you live somewhere warm. I can't remember right now…so I can't commit, lol.No resolution on the tub. He promised a solution but broke off contact and, to be honest, I just haven't had the steam to take him to court. He also hasn't collected on the remainder of the bill, so we're in this weird holding pattern. I know I should deal with it but I just haven't… Yet. da*mn, i'm actually somewhere colder than you–saskatoon. but, we used to live down-ish the street from you in ottawa (we were in a townhouse across from the hill at mooney's bay, on riverside). i do miss ottawa–it was so pretty! wilmataking someone to court is a lot of time and expense and frustration and anxiety (i'm a lawyer, i know). if he doesn't come after the remainder of the bill, depending on the amount, it might be a reasonable decision to cut your losses and research a fix elsewhere. good luck. I miss Ottawa too sometimes! Although I technically lived in Kanata – something I never revealed when we were actually living there.Thanks for your advice about the tub. I actually wanted to be a lawyer and wrote the LSAT until I realized how much paperwork the law really involved, so I'm very disinclined to go to court after this but I will if I have to. Paperwork, argh. Wow! Beautiful detail throughout. Very modern and clean. That wood is a home run. No hint of shabby chic or farmhouse, which isn't for me. Thank you! I used to think I had to paint wood to get a modern look, but I'm increasingly fond of wood grain and modern lines for a contemporary feel with warmth! I'm not a huge fan of the farmhouse look either, at least not in my home. Thanks!! Lol, yes. I bought a new brand of shampoo simply because of the turquoise bottles. Then I bought an aqua soap holder. And then some fabric to sew a pale turquoise shower curtain. I can't stop. BEYOND gorgeous! We are currently remodeling a 1973 house and our master is going in this direction. 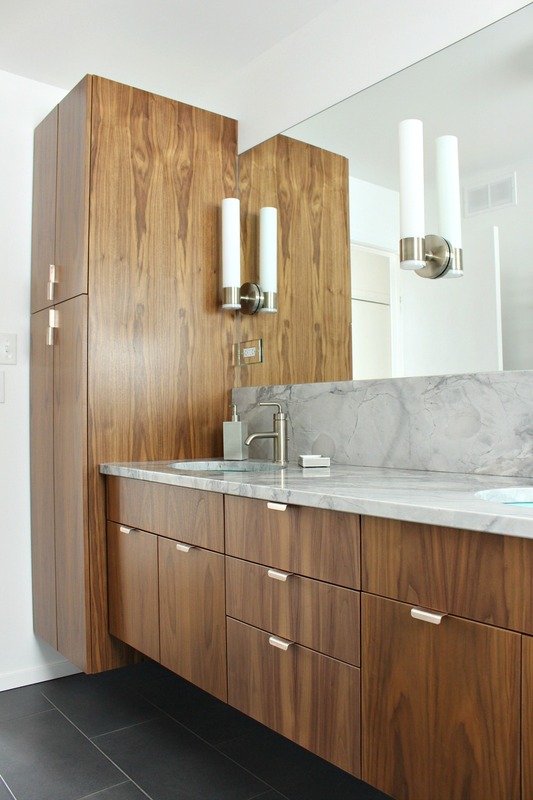 Who made your vanity/linen cabinetry? Amazing job! Thank you! It's by AYA Kitchens. Made in Canada but we were a bit bummed by the problems we had (drawers not closing properly, damaged walnut veneer, and things weren't resolved even after months of back and forth). I love the look and wanted these for my kitchen as well, but we're a bit on the fence – just so you know! This is so GORGEOUS! I bit the bullet and bought some Purist-looking sconces online and my contractor agreed to do it IF I provide the diamond drill bit. I am nervous, but hope it'll turn out half as nice as your project!